The Monticello Railway Museum in Monticello, Illinios, USA, acquired former Southern Railway (US) 2-8-0 number 401 in 1967 from Alabama Asphaltic Limestone, in Margerum, Alabama. A 1907 product of the Baldwin Locomotive Works, the locomotive was part of a static display at the railway museum until 1995, when a generous donor provided funding to restore the locomotive to operating condition. The locomotive had led a hard life and was in very poor condition. During its rebuilding, it required not only a new welded tender, but an all-welded boiler as well. It was also converted to oil firing. 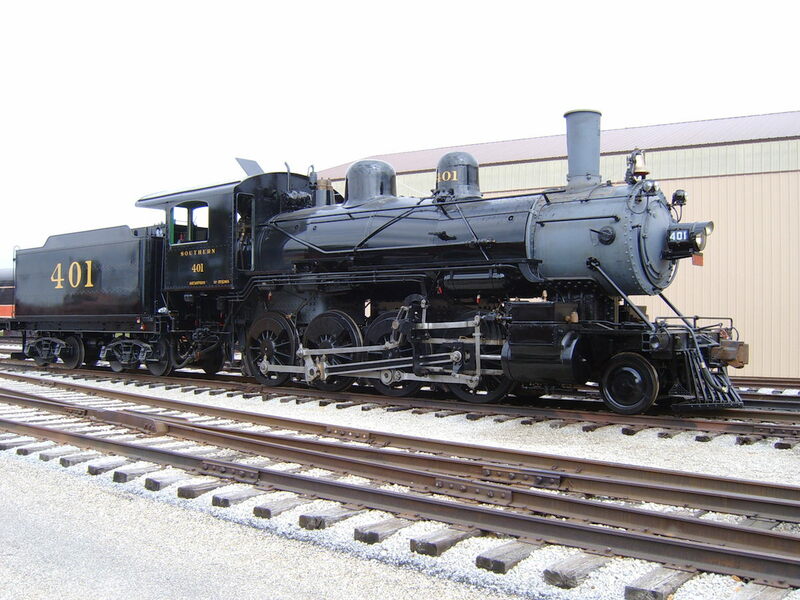 As the locomotive was reassembled, it was realized the original exhaust stand was missing parts, the remaining parts were in very poor condition, and the system could not be salvaged. As long as a new exhaust system was required, what should be built? In 2006, Dr. Jos Koopmans of the Netherlands, who had written a book on the history of steam locomotive exhaust design ("The Fire Burns Much Better") and written his doctoral thesis on the design of steam locomotive exhaust systems, was approached by Kent McClure of the museum with a request for assistance. The original exhaust system used individual blast pipes for each cylinder. Koopmans knew that testing by W F M Goss of Purdue University back in 1902 had shown that this arrangement was inferior to others. Since it was desired to retain the original exhaust stack for historical reasons, Koopmans suggested a new Sweney/Armstrong type exhaust. The group agreed with this proposed solution. Jos did the design calculations and gave them the dimensions for the system, including a new tapered exhaust stack "liner" with mixing chamber and radiused inlet. A very simple exhaust stand was fabricated (basically a tall box of square cross-section) from 1/4 inch steel plate with the Sweney/Armstrong annular exhaust nozzle bolted on top. An advantage of this design is that the exhaust opening can easily be varied during the "tuning up" process by substituting round discs of various sizes in the center of the nozzle. The final disc size that was selected during tuning up resulted in a nozzle area that agreed very closely with the size predicted by Jos. The only issue that has come up with the locomotive is that it appears insufficient inlet air area was initially provided in the firepan with the new oil burning arrangement. The group initially followed the guidance of Ralph P. Johnson's book "the Steam Locomotive" which recommended that the air inlet area in the firepan equal 30% of the area through the boiler tubes. This greatly restricted airflow through the boiler, requiring a restricted exhaust nozzle opening to proivde sufficient draft. Nigel Day was consulted and he recommended a firepan air inlet area of 80 to 100% of the boiler tube area. After the first operating season, the firepan was modified to provide approximately 62% of the boiler tube area. This enabled the exhaust nozzle to be significantly opened, resulting in much less backpressure with no loss of steaming capability. The group plans to increase the area to at least 80%, but this will require fairly extensive work, so it is being delayed until the 5 year inspection required for the flexible staybolts, at which time much of the brickwork will have to be removed. This photo shows the exhaust stand and basic nozzle installed in the locomotive's smokebox. Welded fabrication built from 1/4 inch steel plate. While the exhaust system worked well, it was thought additional improvements were possible by streamlining the interior of the exhaust stand and providing smooth transitions to the annual exhaust nozzles. In 2012, a "liner" was designed for the exhaust stand in Solidworks, fabricated and installed. Additionally, parts to streamline the flow from the stand into the annular exhaust nozzle were designed, fabricated, and installed. 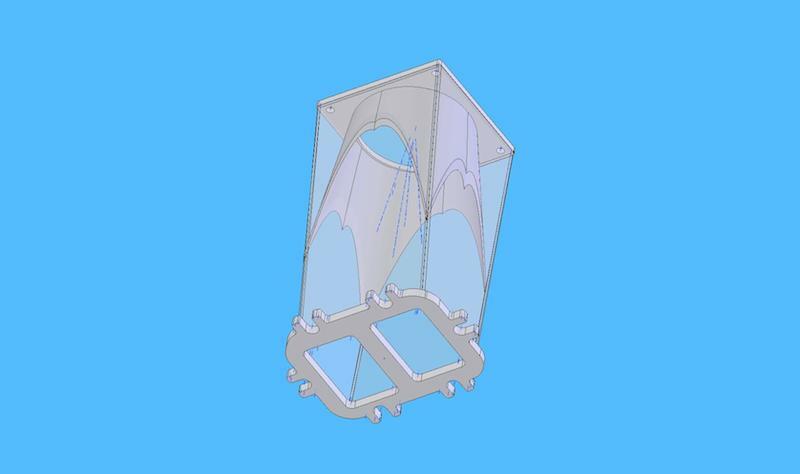 Solidworks Model of Exhaust Stand "Liner"
Additionally, parts were designed, fabricated and installed to streamline the flow path into the annular exhaust nozzles. While these modifications have not been properly tested, it is felt they have contributed to the locomotive's good performance. Thanks to Jos Koopmans and Kent McClure for the information and photographs above.